"With name comes responsibilities, and every youth has the potential of taking it. All that is needed is the determination to be the best of what you are! ", says Prathiksha Prakash, the Young Champion of 18, pursuing law in University Law College, Bangalore. Along with her academics, today, she stands out as an excellent badminton player proving that life is not confined only to academics and performance in it! This day, she stands as an inspiration for many people to show that determination to give the best makes you the best. In regard to this, I would like to share about one of her events in her life which is her pride and a milestone to success! With all the efforts she has put till date, Prathiksha realized that she has to do something bigger and better. For the opportunity she was waiting to explore herself, it is amazing that the 'Spiritus'15' arrived at her doorstep when she just came back from her tournament moderately in Gulbarga. 'Spiritus' is a sports event conducted at a national level where excellent players of different kinds from different colleges participate to compete amongst each other and to prove themselves as the best. This event is held every year by Sports Authority of India in Bangalore. With just one day left for her practice, Prathiksha took up rigorous practice in that single day which shows her determination to be the best! The next day, she started off fresh with her competition with JSS Mysore team after a vigorous practice before the match. Having analyzed her enemy in just 3 minutes of time, showing her presence of mind, Prathiksha made it up to win in the first singles. Also, along with her team mate Swathi Suresh, they made up to win the reverse doubles entering the quarters. 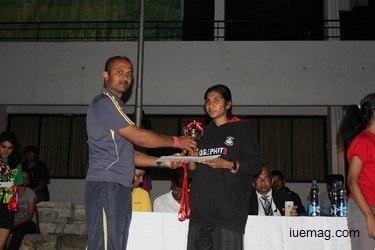 She also went on the next day representing her state Karnataka, took it off for the quarters to rock against the India Law School, Pune whose players were excellent. "It is when that single decision to make it big and stand an example, is made up and actions are taken, that everything starts", says this young lady who with her tactics, observation, mental preparation, determination and complete focus on the game, at the right time, made it to win over an amazing opponent team making way to semi-finals. "Here, I would like to mention and appreciate the efforts of my friend Priyanshu Agarwal, who was there every minute motivating me to win", she mentioned. With the mental preparation to tackle the upcoming opponents and the aggression to make it big, Prathiksha and her team mate Swathi were all set for the semi-finals. Having the aggression and the determination to make it happen at any cost, injuring herself during the course of play, Prathiksha's decision to fight back is the most amazing thing and the actual spirit of a person of passion and aggression! This spirit made this amazing team win over the opponent in the semi-finals showing that holding on to your decision though it is tough, makes you stronger! Having entered the decision making and challenging finals , Prathiksha motivated herself to make sure she will be the best performer in the court. Representing our state Karnataka, this champion went on to add another achievement to the list by making her way to win the match against the excellent Fymbiosis team. "It was a neck to neck match where both teams were excellent which made me more aggressive and the only thing I shouted when the opponent team's supporters made fun of me was.. "Take me in!" All these made me strong to win it! The event gave me a lot of learning to imply in life", she narrated. Prathiksha's presence of mind and logic to attack the weak one in the opponent team finally made the determination to win - The dream to take it higher and bigger, the dream to add another achievement to the list, come true. This decision to do an extra to the ordinary made her extraordinary. I congratulate and wish Prathiksha the best on behalf of all the readers, learners and achievers here. This lady today, stands as an example for all of us showing that 'If you dream it, just make it happen no matter what!' Don't we all want similar happiness and achievements in life? It is all in our hands to make it big, that one day, our country feels proud of us. Such qualities of hers are the things we also should observe and imply in our life. That is when we learn. That is when we grow. That is when we achieve! Any facts, figures or references stated here are made by the author & don't reflect the endorsement of iU at all times unless otherwise drafted by official staff at iU. This article was first published here on 11th September 2015. Keerthana MR is a contributing writer at Inspiration Unlimited eMagazine.